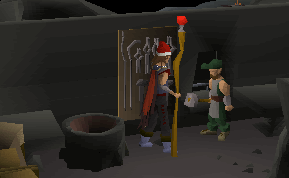 Construction is a skill allowing you to make all sorts of things, including toys, furniture for houses, decorations, and other cool furnishings for your own Player Owned House. 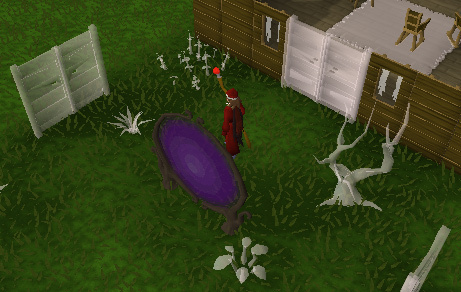 You are even able to train other skills in your Player Owned House, and there are a number of cool things you can do, like have parties or build a deathtrap for other player to try to complete for a prize. Varrock East of Varrock Castle. 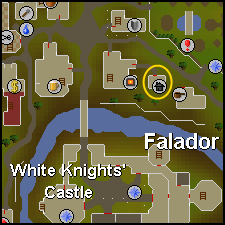 Falador East of the furnace. Seers' Village Northeast of the bank. East Ardougne Northwest of the bank. 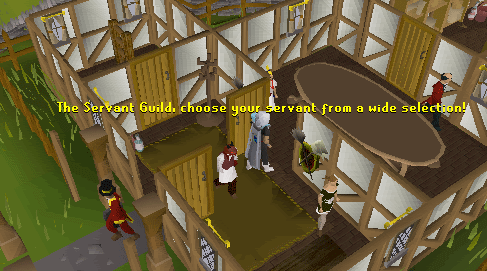 Once you speak to him, ask him about getting your own house, and then buy one for 1,000gp. 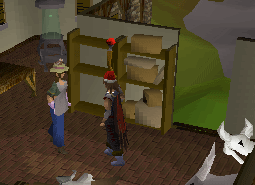 After paying, you'll get a Construction Book, and you'll now be able to enter your house. 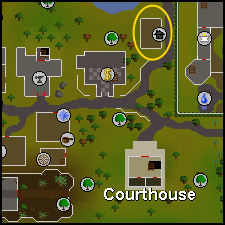 So, head on over to Rimmington - this is where your house is located. Eventually, you'll be able to have it moved to another one of the available locations, but for now, you'll be living in the town-where-not-much-happens. 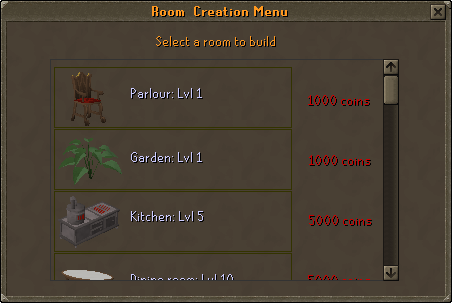 Go to Your House (Building Mode) - brings you to your house, and allows you to build furniture, rooms, and interact with the objects that make up your RuneScape home. You can't edit your house any other way. 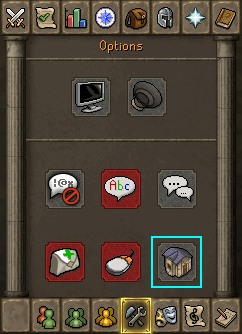 Remember: if you've set a PIN for your bank, you'll also need to enter it when going to your house in Building Mode. Go to a Friend's House - type in your friend's name to enter his or her house! As long as they are in their house, not in "building mode," and they are allowing other players to enter (this is explained in just a bit), you will be able to go to their house. To leave a Player Owned house, either go back through the portal, or go to the house options menu and select "Leave House". These are the main items that you will use throughout your Construction career... use them with care! 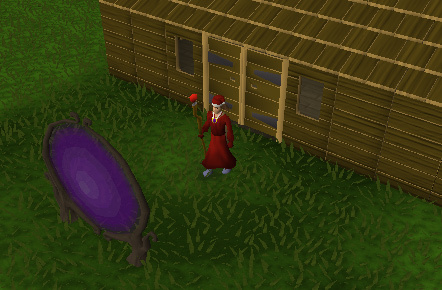 If you have level 40 Magic, you can cast the Teleport to House spell to be teleported either directly to your house or outside the portal. 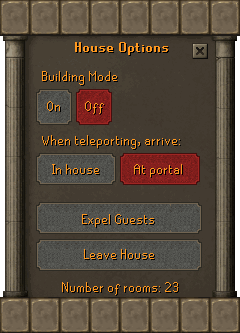 To toggle this, open up your house menu and under "When teleporting, arrive" select either "In house" or "at portal". This spell requires 1 Law, 1 Earth, and 1 Air Rune to cast. In Your Player Controls menu, you will see an option called "House Options." Next you will have the option of where you will appear after teleporting. Select "At portal" to spawn outside of the portal, or "In house" to spawn in your house. Lastly, you have the option of expelling your guests, which means that you can kick everyone out if you want. This is particularly useful if you're throwing a wild party while your parents are out of town, but they come home early (can you really have parents in RuneScape?)! And finally, you have the option to leave your house. By putting your private chat on friends, off, or by adding/deleting players from your friends list. Players on your ignore list will not be able to enter your house. This is pretty easy to do. 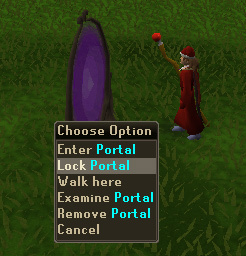 While you're inside your house area, right-click on your portal and select the "Lock Portal" option. This will prevent anyone from entering your house. Later on, you can select the "Unlock Portal" option to allow people to access it again. This is a cool feature of Player Owned Houses too. If you have your friends list set to "On," anyone can access your house. If you have it set to "Friends," only people on your list can enter your house. And if you have it set to "Off," no one can enter your house (this is just like locking your portal). There are a few very important characters that you will probably need to visit at one point or another during your Construction career. Let's take a look at each of them. This is the first person you'll have to speak to before beginning to construct your house. These gentlemen can be found in several different places, and it doesn't matter which one you speak to - they all do the same things. Our next stop is at the Sawmill Operator, a kind fellow. 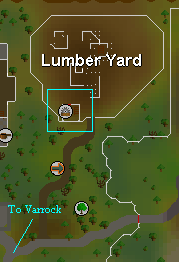 The Sawmill Operator can be found a short distance south of the Varrock Lumber Yard, which is used in the Gertrude's Cat Quest. He will make you some Planks in exchange for some cash for each, and a set of logs. When you're first starting out, you'll probably want quite a few Planks and Nails, as well as a Hammer and Saw, although you could also smith your own nails and save some money, especially if you have the metal bars on hand. He also has a shop, and will sell you various basic Construction items, such as nails, a saw and cloth. 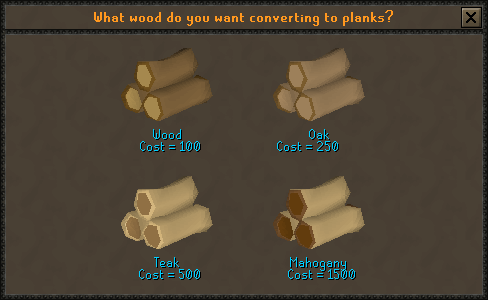 Plus, he will make you some Planks if you give him some cash, and a set of logs. When you're first starting out, you'll probably want quite a few Planks and Nails, as well as a Saw, although you could also smith your own nails and save some money, especially if you have the metal bars on hand. He sells more advanced building materials, such as Limestone Bricks, Marble blocks, Gold Leaves, and Magic Stones. But believe me, the last 3 are NOT cheap! If you're just starting out, you won't need these materials for awhile, but it's always a good idea to know what you're getting yourself into. 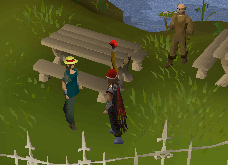 The Garden Supplier can be found wandering through the Falador Park, and sells you various plants, trees and flowers to add some pizzaz to your house's surroundings. She sells all sorts of bagged trees, plants and flowers to make the area around your house look... however you'd like it to. The default stocks of each item are infinite, so there are much more than enough bagged items to get you started. 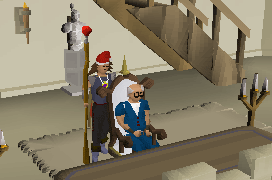 Once you reach level 16 Construction, you will be able to get your family crest from Sir Renitee, and you will need this before being able to paint your own armor. To paint armor, you need either a Steel or Rune Full Helmet or Kite Shield. Both painted rune or Steel items will look the same, but the rune items' stats will be better. You can also paint your crest on Banners. Sometimes, you may be lucky enough to find a part of a dead monster (such as a head) after you kill it, and sometimes when fishing, you'll catch a much larger version of whatever you're fishing for. Just take this to your local Taxidermist, and for a certain price, she will stuff it for you. Your house must have 2 bedrooms, and each bedroom must contain a bed before being able to hire a servant. To send your servant to the bank, simply right click on them and select "Fetch from bank". You will automatically be given the option to select from a list of Construction supplies that would help you while training or building. Select the item and the amount and the servant will go to the bank. If you are training construction, the servant will memorize your choice and the next time you select to fetch, you will automatically be given the option to select the same item and amount as you did the last time. This is very helpful while training quickly. When it is time to pay your servant, you will not need coins in your inventory. You may select an option to pay the fee from your bank. 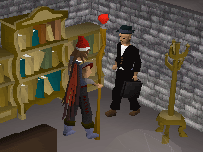 If you would like a non-construction-related item brought to the bank, simply use it on your servant. Use tea leaves with teapot. The Saw bonus will stack with the Homemade Tea and Evil Dave's Stew of DOOM. The Crystal Saw has 28 uses, and after you make 28 pieces of furniture with it, it will revert back to its original seed form. 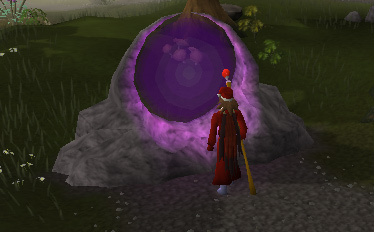 This seed can be brought back to the Singing Bowl in Brimstail's Cave to change it into a Crystal Saw, as you did in the Eyes Of Glouphrie Quest. The great thing about Construction and Player Owned houses is that you can design your house any way you'd like. At first, you're limited to very basic things, such as chairs and rugs. But you'll eventually be able to build other kinds of rooms, furniture, and more interesting things to accommodate your house. If you have the appropriate level, enough money, and haven't reached your room limit, you can build another room. As your Construction level increases, you are able to build more and more rooms in your house. Temporary increases to your Construction level will not allow you to have an extra room even for a short time. Note: It's worth noting that gardens and formal gardens are also counted as rooms. Each room has specific types of "Hotspots" - this is where you can build certain kinds of furniture. 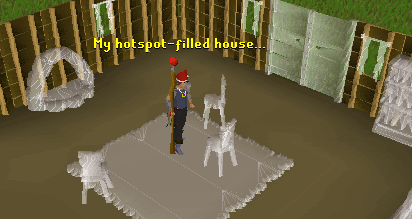 When you build furniture, the hotspot is "filled," so you can't build anything else there until you remove the furniture. Now that you know about rooms, it's time to learn about how to build furniture. You'll see a screen of all the different items that can be built on that Hotspot. Items that are crossed off can't be built (you may need a higher level, or more supplies), while yellow ones can be built. Just select an item and your character will build it. And that's all there is to it! Note: Sometimes you will also bend a nail while building furniture, so you'll probably want to have some extra ones with you while building. Later on, if you wish to remove an item from your house, just right-click on it and select the "Remove" option. Flatpacks are packages of furniture made on the workbench of your house. They can be constructed in building mode or normal mode. 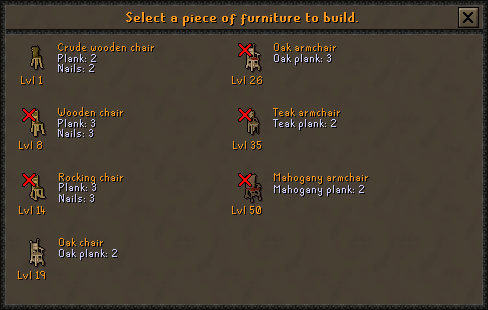 The same amount of items is needed to make the flatpack as you would normally make the furniture. You will also need a saw and hammer in your inventory. You get experience per item for building one but not for using one to build. They can be used at any level. This is a fast and efficient way of training construction. This isn't a room, but it is a very important part of your house. first, you must have a garden because you must have a portal, and this is the only place you can have one. If you have two gardens, you can place a Dungeon Entrance in one, rather than another portal. You can also plant all sorts of trees, bushes and flowers out here to make your house look any way you'd like. When building a garden, the entry portal will always face you, and you will always spawn northwest of it when entering your house. Ever wonder if there was any use for those broken armors or bent arrows? Well, you can repair them with your Workbench! Or, you could sharpen those Rusty Swords on a Whetstone... Or, you could set up an Armour Stand and repair your degrading Barrows Armor! There's all sorts of fun to be had in the WorkShop! Unlike the other rooms, you will not see a ghostly outline of the contents of this room as you start to build it. There is also no scope for rotating it before confirming its purchase. For those who wish their stairs to be positioned in a certain way, this can end up being an extremely costly room, as builders are forced to rip it out again and try again from another spot. However, there is a rule governing its positioning. From whichever doorway you stand to create it, the stairs will rise towards you and above your head. Therefore, if you plan to enter a certain doorway and carry straight on up your staircase, build it from the exact opposite doorway and it will be where you want it to be. In this picture, the stairs were created from the door hotspot in which the player is standing. Once one room is positioned correctly (Skill or Quest Hall), then the room above will automatically arrange itself to match its positioning. Until you reach the level of spiral staircases, only one set of stairs needs to be built (for example, the stairs built on the lower floor will provide access to and from the floor above). However, with spiral staircases, each room needs its own section to be built. With this in mind, when building oak or teak staircases, gather the materials for only one. When building spiral staircases upwards, multiply the materials by however many floors you have. Treasure Hunt - everyone in the game is given a Magic Stone by a Fairy, and then she hides. You must find her by feeling the stone. If it's colder, she's far away, and if it's warmer, she's closer. Boxing Ring - requires a Glove Rack and 2 players. Enter the ring wearing just Boxing Gloves, and the last player standing is the winner. Fencing Ring - requires a Weapons Rack and 2 players. Enter the ring with only a weapon equipped, and you'll be able to fight your opponent. 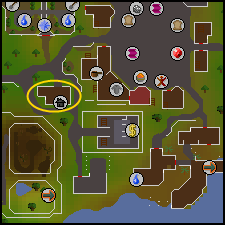 This is a great place for those magical RuneScapers out there. You can set up a Crystal Ball to change the element of a staff (an Air staff to a Water staff, for example). Or you could have a Lectern which allows you to craft spells. Sounds odd, no? Crafting a spell simply means that you make a magic stone which you can sell to other players so they can use the spell even if they're not a high enough level. The Menagerie is an outdoor room space that you can build at level 37 Construction. It serves as a place for you to keep your Summoning pets and also to recharge your Summoning points with an Obelisk built into the designated hotspot. You can add a habitat to change the style. It costs 30,000gp to build. Pet houses and feeders require you to update the previous item. That means you will need to progressively build up from the lowest items until you've reached your desired type of house or feeder. You may only store a pet if it is fully grown. You can only have one of these in your house, but it is movable. When you try to build a second Menagerie, you will be given the option to move the first one. Any type of pet except Pet Rocks, Fish, and Clockwork cats can be kept here. The pet feeder will automatically feed the hungry pets around your house, however hungry pets in your inventory will require you to click on the feeder and select "Feed". The pet must be in your inventory, it will not feed any pet following you as a familiar. You will not be able to talk to any wandering pets except for the Ex-Ex-parrot. The Oak pet feeder and pet house both can serve a maximum of three stored pets. The Teak pet feeder and pet house both can serve a maximum of six stored pets. The Mahogany pet feeder and pet house, as well as the consecrated, desecrated, and natural pet houses, can all serve a maximum of ten stored pets. Habitat-Sets a scenic environment for your habitat. Pet house-A place to store your pets, up to 10 pets with the highest leveled upgrade. Pet feeder-Click on this and any hungry pet in your inventory will be fed. 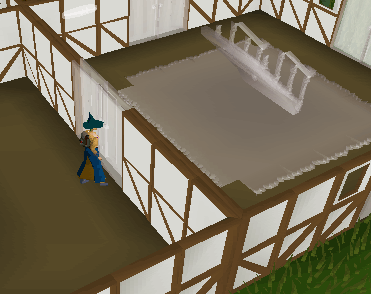 Once you achieve level 42 Construction, you have the ability to add a Costume Room to your house. As the name implies, this room allows you to store the various outfits that you may have picked up during your travels, including Treasure Trail items, Activity armor, quest equipment sets, and Capes of Achievement, along with a number of other items. The below chart provides you the bonus percentage of prayer experience you will receive if you offer bones on your altar. If you light your torches in your altar room, and use bones on your altar, you will receive a greater percentage of experience depending on the number of lit burners. Note that, the better your burners, the higher your experience percentage bonus will be. You can set up teleports to other places in RuneScape from here - Particularly useful if you're always trying to get somewhere in a hurry! 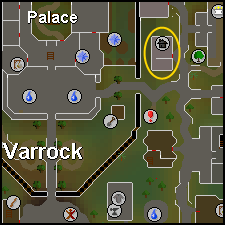 After completion of the easy Varrock Tasks and setting your Varrock Teleport location to the Grand Exchange, your portal will also lead there. If you have a Scrying Pool, you can "focus" portals and view the destination from your own house. Similar to building a regular Garden, the entry portal will always face you, and you will always spawn northwest of it when entering your house. Here, you can set up a throne to sit at and rule your castle... err... house. You can set up traps to "get rid of" your enemies, along with a lever to activate the traps. That's pretty much all there is to Construction and Player Owned Houses, hopefully this guide helped you with this skill! Happy house-building!